Designed in top-notch style and durability, this Monarch Specialties full back bar stool is sure to spruce up your kitchen. You'll appreciate how well its contemporary design fits into any room in your home. The adjustable height makes it an easy fit to any size bar or counter. Its chrome base frame gives a stylish flair to this piece, surprisingly easy to match with other decor. The plush curved stool back and seat are covered in grey leatherette to complement your taste. A shiny steel base with a high polished chrome finish supports the chair with a hydraulic lift and round footrest for comfort. Transform your home into a fun hangout with this stylish bar stool. Beautiful in style and durable by design, this !nspire full back bar stool is sure to blend perfectly into your kitchen or dining area. Its contemporary look pairs well with a wide variety of rooms and decor styles. The base frame colour adds a fun style punch, and is surprisingly easy to match with many decor colours and styles. The timeless fashion of the Kendal Bar Stool offers exceptional versatility and comfort that pairs beautifully with any home decor. Outfitted in a high performance, easy care Paradise fabric and designed with a curved tufted back as well as nailhead accents. Modern flair is complemented by simple style and luxurious attitude with this bold pair of bar stools. This set of two features strong legs that were built with quality craftsmanship and provide a solid foundation for the seat base. Soft padding in the seat and chair-backs are wrapped in resilient, low maintenance faux leather. Perfect for your breakfast counter or the basement bar, these bar stools sit tall and strong making a beautiful statement in your space. Available in soft cream, rich espresso and deep red. Create a relaxing and comfortable spot in your kitchen with this pair of fabric bar stools. Marked by its streamlined form, the gently curved backrest invites you to relax in the supportive high-density foam cushioning as you enjoy breakfast at your counter. The chrome legs perfectly complement the fabric upholstery resulting in a beautiful contemporary look you'll love. Bring home this pair of fabric bar stools to create the kitchen you've always wanted. 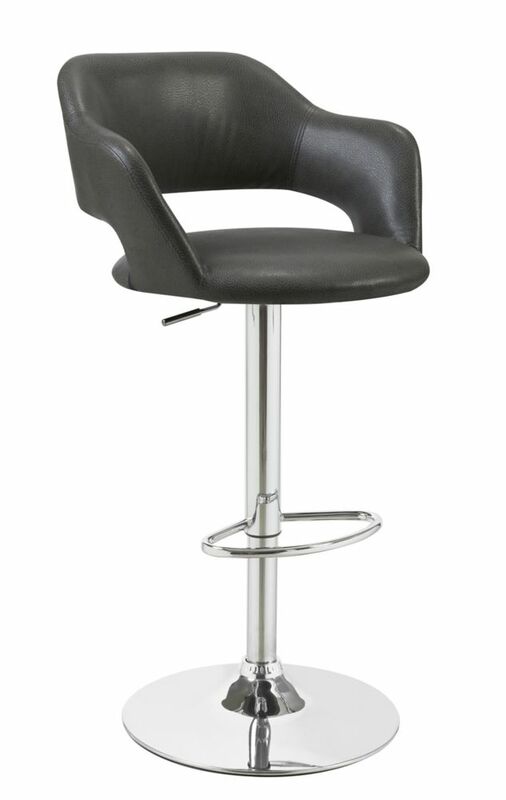 Leather Metal Chrome Contemporary Full Back Bar Stool with Grey Faux Leather Seat Designed in top-notch style and durability, this Monarch Specialties full back bar stool is sure to spruce up your kitchen. You'll appreciate how well its contemporary design fits into any room in your home. The adjustable height makes it an easy fit to any size bar or counter. Its chrome base frame gives a stylish flair to this piece, surprisingly easy to match with other decor.